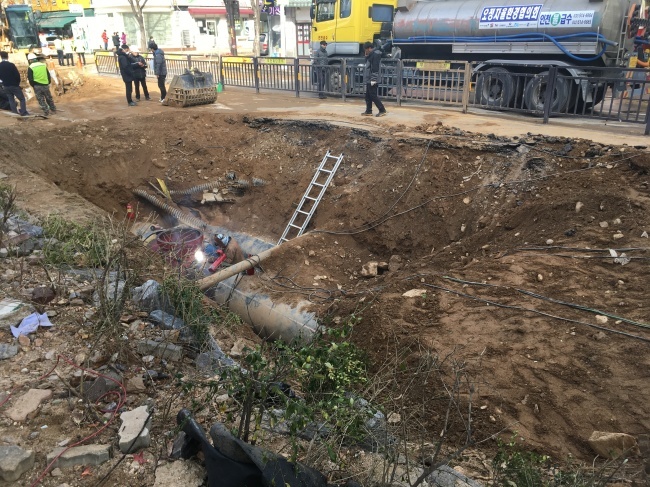 The police investigation into the rupture of a hot water pipeline near Baekseok Station in Ilsan, Gyeonggi Province, is set to expand to employees of subcontractors who were in charge of maintaining, repairing and inspecting the pipe involved. According to police sources, the heat pipeline maintenance and inspection companies had used subcontractors for the work. “We will call in the employees of each company to continue the investigation,” police said. Police confirmed that the 27-year-old pipeline exploded when a welded segment of the pipe burst open. Since the age of the pipeline has been blamed for the accident, police will conduct a comprehensive inspection as to whether the pipe that is nearly 30 years old has been repaired or inspected according to regulations. If wrongdoings are found, responsible persons could be charged as criminal suspects related to the case. The joint inspection of the accident by the National Forensic Service and police is expected to take longer. “It will take four to five more days,” police said. Police are also reviewing options for the search and seizure of Korea District Heating Corporation to secure related data.